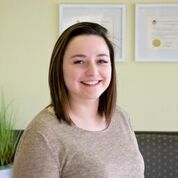 Makayla joined our Team in September of 2017. She has a background in health care, and enjoys all that there is to learn about Optometry. Her main expertise is at the front desk, but as she continues to grow, she will be exploring her hand at other areas in the clinic. Makayla is a new resident to Armstrong, having lived mostly in the Okanagan throughout her life. Gardening and spending time with her family (including her cat “May” and dog “Babe”) are her favorite things.